Help your pet find their perfect balance and ease troubling urinary issues with Solid Gold Berry Balance. Suitable for both dogs and cats, Berry Balance provides support for urinary tract health and function in your pet. Berry Balance is a holistic grain-free supplement that is based in natural, recognizable ingredients like cranberries and blueberries. Cranberries and blueberries provide a rich, natural source of antioxidants and Vitamin C, which help promote proper urine mineral balance and a healthy urine pH. A normal urine pH may reduce the likelihood of crystal formation. 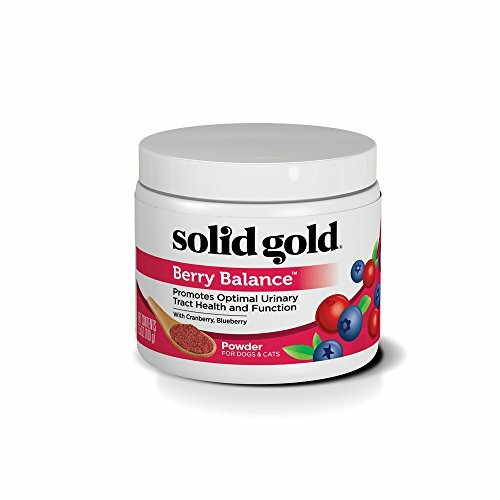 Solid Gold Berry Balance powder is easy to use: simply administer with food at mealtime twice a day for the first month. After 1 month, reduce to once per day, three days per week. Grain and gluten free. No artificial colors, flavors or preservatives. Made in the USA. Leaping for frisbees and jumping on the couch for cuddling can be challenging for a dog with joint stiffness. Don’t let joint issues get in the way of your dog’s playful life! 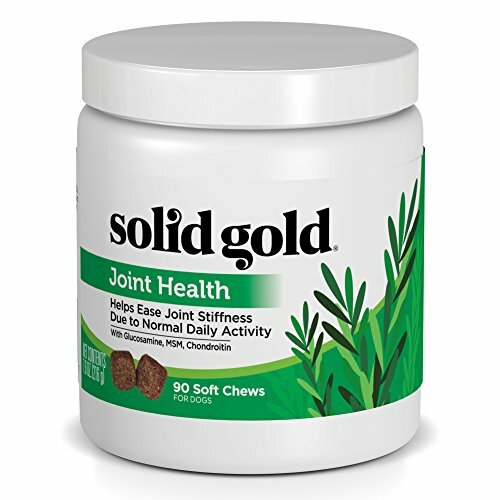 Solid Gold Joint Health helps support proper joint maintenance and ease joint stiffness due to normal daily activity. Use daily to help maintain strong bones, healthy cartilage and joint function and mobility. Includes Omega Fatty Acids and antioxidants for overall wellness. Solid Gold Joint Health is a convenient and delicious chew your dogs is sure to love. 90 count jar provides 45-day supply for 11-39 lb dog. See packaging for dosage recommendations by weight. No artificial colors, flavors or preservatives. Made in the USA. Coprophagia is an unpleasant habit – help break the habit of your dog’s stool eating with Solid Gold stop eating poop. This easy-to-use chew naturally makes the stool taste bitter to make it unattractive to the dog consuming the stool. Stop eating poop chews also contains superfoods like peppermint for breath aid and parsley oil to soothe digestion. Carefully selected digestive enzymes also help dogs digest and utilize food more efficiently, which helps reduce stool output. 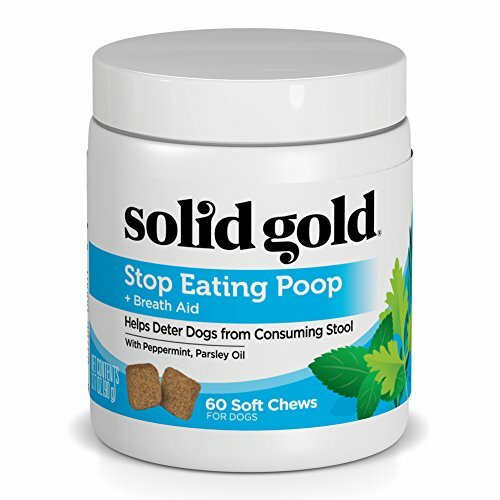 Give Solid Gold stop eating poop chews to the dog whose stool is being consumed. For use with dogs only – not for use with cats. Give to your dog twice daily for first 2 weeks, once daily after that. A decrease in stool eating behavior generally occurs after 2-4 weeks. See packaging for dosage guidelines.grain and gluten free. No artificial colors, flavors or preservatives. Made in the USA. An upset stomach and troubling digestion is no fun – for you or your pet! 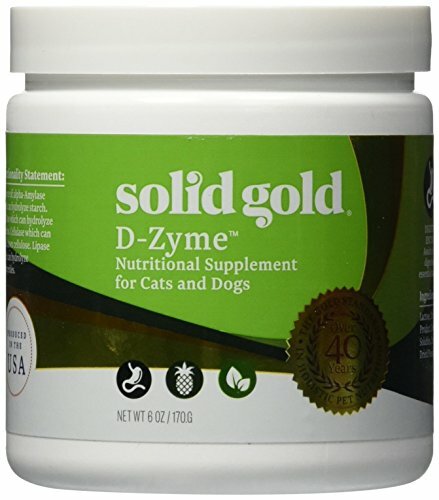 Solid Gold D-Zyme supports healthy digestion for dogs and cats. D-Zyme powder contains a powerful combination of natural digestive enzymes and healthy Superfoods like pineapple, basil and sage. Our unique blend of digestive enzymes aids in proper digestion and supports bowel health by helping pets break down and more efficiently utilize food during the digestive process, allowing them to absorb more of the essential nutrients from their food. D-Zyme powder is easy to use! Simply add to your pet’s food at each meal. Grain and gluten free. No artificial colors, flavors or preservatives. Made in the USA. 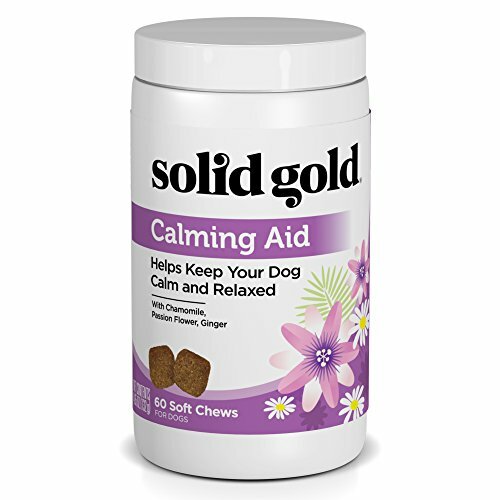 Help your pet find inner peace again with Solid Gold Calming Aid Chews. A powerful blend of natural ingredients, including chamomile and passion flower to promote a sense of relaxation and mental alertness without drowsiness, plus ginger to support sensitive stomachs. L-Tryptophan and melatonin help dogs manage stress while also helping to reduce destructive or anxious behavior. 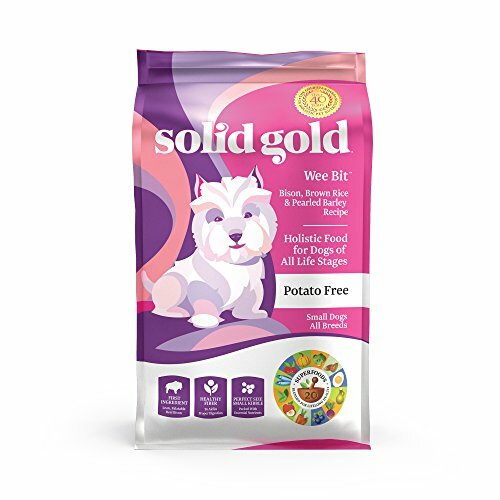 Solid Gold Calming Aid is ideal for use to help dogs cope with everyday stress including travel, boarding, separation, vet visits, thunderstorms and fireworks. This delicious chew is easy to feed and is great for even picky eaters. Administer chew 30 minutes prior to stress-inducing event to help promote rest and relaxation. 60 count jar provides 30 doses for 27-50 lb dog. See packaging for dosage recommendations by pet’s weight. Made in the USA. Caution: Consult your veterinarian prior to using this product if your pet is taking MAO inhibitors, sedatives or prescription pain mediation. Pesky hairballs are not fun for your cat or your floor! Help your cat find natural relief with Solid Gold Hairball Aid. These grain-free chews are high in healthy fiber from natural ingredients like pumpkin and psyllium husk to help reduce hairball formation and promote healthy digestion. Flaxseed also helps support a health skin and coat to promote normal shedding and reduce hairball formation. 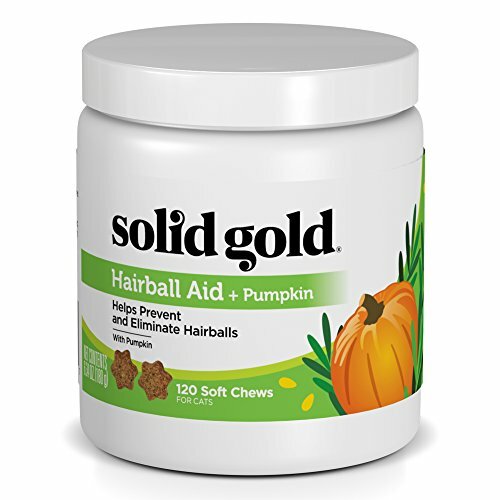 Solid Gold Hairball Aid is free of petroleum, lubricant and laxatives. These chews are delicious and easy to use, only 2 chews needed per day, compared to 6+ required by other products. 120 count jar provides 2 month supply. Grain and gluten free. No artificial colors, flavors or preservatives. Made in the USA. On the prowl for a grain free food your cat will love? 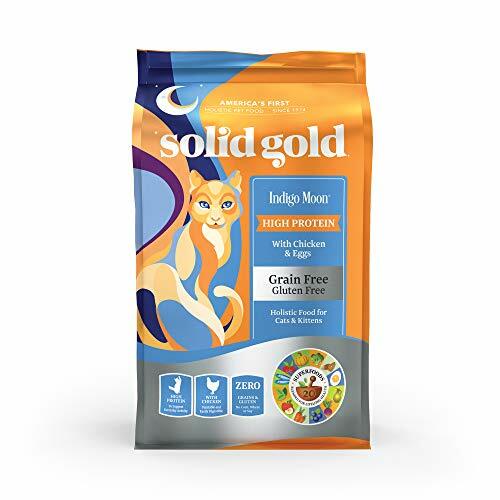 This high protein formula provides a combination of nutrient dense ingredients & healthy fats all packed in a unique kibble with the flavor your cat craves. This recipe is crafted with 20 Superfoods & packed with nutrient dense chicken & egg nature's perfect protein. At 42% protein this recipe is sure to please even the pickiest palate and provide the protein and energy your active cat needs to play for hours! This high protein low carbohydrate recipe can also be beneficial for cats with diabetic health concerns when fed under veterinary supervision. 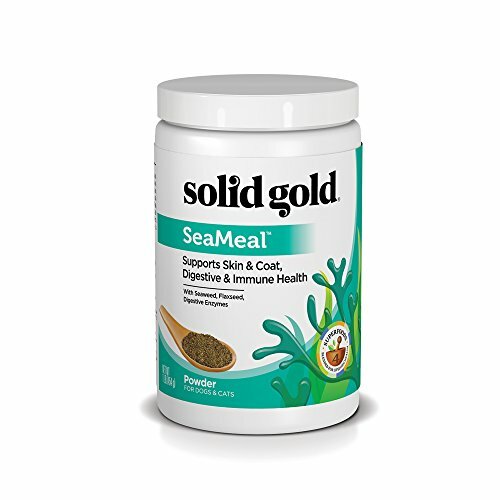 Shopping Results for "Solid Gold Supplements"